When you like to work with power tools, you quickly learn to be leery of seemingly good deals when it comes to the price. So, when you want to buy a grinding machine to sharpen your tools, smooth rough metal edges, and polish metal pieces, you start with those machines that aren’t too cheap. 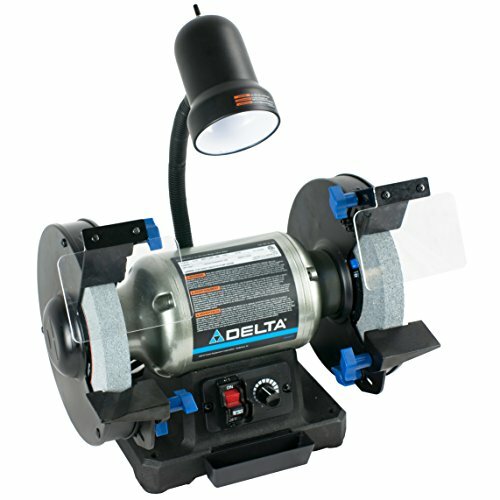 This Delta Power Tools 23-197 8-inch Variable Speed Bench Grinder certainly qualifies. But then you take a look at the list of features, and then you start to worry about the catch. There has to be one, right? Because this thing offers a bit more than what you ought to get, based on the price alone. At its price point, the Delta Power Tools 23-197 8-Inch Variable Speed Bench Grinder should be your basic, but solidly built, grinding machine. But it’s a bit more than that. Variable speed. This is the first thing you tend to notice. For the most part, affordable grinding machines come with a single RPM setting. You don’t have much of a choice. This single-setting design enables the manufacturer to cut down on the production costs. But this lets you use the regular 3,400 RPM setting that’s about right for most grinding tasks. Yet, with this you also get the lower 2,000-RPM setting that’s more appropriate for other special tasks such as removing rust and polishing metal. Setting the RPM rate means just turning a dial to the correct setting. 8-inch wheels. 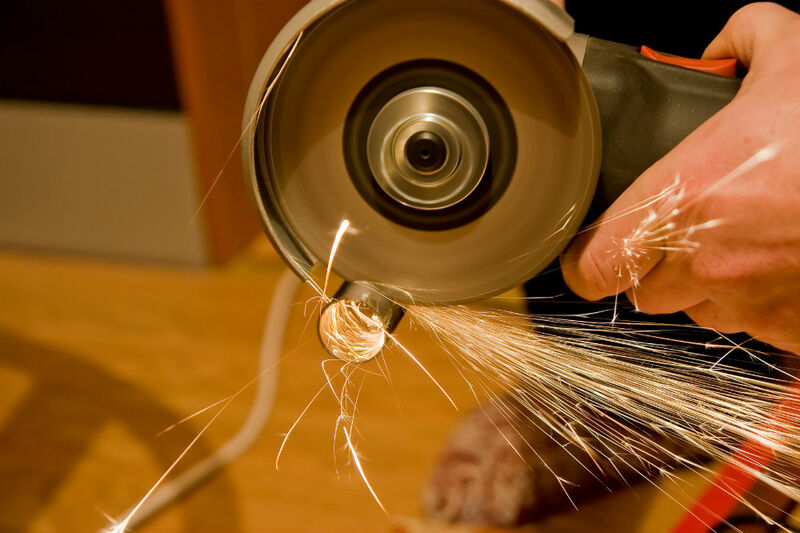 Here you get the 36-grit wheel that works for you to quickly get rid of unwanted material, while the 60-grit wheel allows for some finer sharpening. These are 8-inch wheels, so they’re more effective at grinding than the 6-inch versions. Good work light. Since it shines a light right up at your workpiece, the work light is quite noticeable. It’s adjustable, so you can set the neck to the level and direction you want. What’s more, it has a separate on/off switch of its own. This means that even when you stop the wheel from spinning, the light stays on so you can inspect your metal workpiece more clearly. If it’s already bright enough in your workshop, you can always just leave it off, too. Cast iron base. This makes it weigh about 44 pounds, but then at least you minimize the vibration when you work. Adjustable tool rests. The tool rests are substantial, and you have blue-colored levers on the sides that let you adjust them to get different angles and to account for wheel wear. As a nice touch, the tool rest at the left side has a drill bit milled right into its surface. This lets you get the right working angle on that tip every time. Water tray. As you should know, you should dip your metal workpiece into water when it gets too hot when you’re working on it. This comes with a water tray right there, conveniently in front. The on/off switch has a lock. This keeps you from inadvertently turning on the machine when you’re changing the wheel. It keeps kids from playing with your grinder, as well. The motor is certainly robust and powerful enough, so the wheel won’t slow down too much upon contact with your workpiece. The variable speed lets you pick the appropriate RPM setting for many different types of tasks. So, if you want to remove unwanted parts quickly, then you can stick with the 3,400-RPM setting. With the 8-inch wheels, grinding away is easier. But you can do finer work and go with the lower setting, too. The attention to detail when it comes to the tool rests is outstanding. It’s easy enough to adjust, but the drill bit milled into the surface is certainly convenient. There’s a light, too, as most of these grinders ought to have. It’s also great that at least you have a separate switch for the light, instead of having it turn on when the wheels are spinning. At least with this you can have the light even when you just want to inspect your workpiece. There’s even a water tray. It’s an unexpected benefit and a welcome convenience. The warranty is for five years. It’s a bit complicated to assemble and it’s not super-easy to remove the eye guard when you replace the wheel. It’s a bit heavy, so it’s not very portable. It sure does seem like you’re getting more than your money’s worth with the Delta Power Tools 23-197 8-Inch Variable Speed Bench Grinder. It works great with variable speed, it offers all these small convenient touches, and that five-year warranty is amazing. It sure is a keeper.